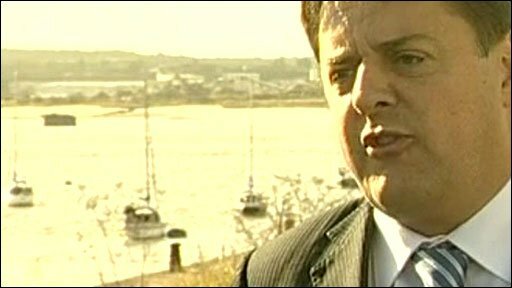 Nick Griffin: "It was not genuine Question Time, it was a lynch mob"
BNP leader Nick Griffin is to complain to the BBC over his controversial appearance on Question Time, saying he had faced a "lynch mob". Mr Griffin argues the normal format of Thursday's programme was changed and it should not have been held in London. The fallout from the show - watched by eight million people - has intensified, with Mr Griffin's fellow panellists saying he had been "shown up". But critics said the show had given the BNP huge publicity. The BNP claims 3,000 people registered to join the party during and after the broadcast. Meanwhile, an opinion poll carried out after Mr Griffin's appearance suggests 22% of voters would "seriously consider" voting BNP in a future local, general or European election. Two-thirds of the 1,314 people polled by YouGov for the Daily Telegraph dismissed voting for the party under any circumstances, with the rest unsure. However, more than half of those polled said they agreed or thought the party had a point in speaking up for the interests of indigenous, white British people. Welsh Secretary Peter Hain, who led a campaign to exclude Mr Griffin from Question Time, said: "This is exactly what I feared and warned about. "The BBC has handed the BNP the gift of the century on a plate and now we see the consequences. I'm very angry about this." The BBC has defended Question Time, which was watched by four times its normal audience but also attracted a large number of complaints, saying it had a duty to be impartial and that audience members had selected the questions which set the programme's agenda. More than 240 complainants felt the show was biased against the BNP, while more than 100 of the complaints were about Mr Griffin being allowed to appear on Question Time. In addition, more than 50 people contacted the BBC to show their appreciation for the programme. What did voters make of Griffin? Mr Griffin, who was one of two BNP candidates to be elected to the European Parliament earlier this year, faced robust questioning about his views on race, immigration and the Holocaust from a largely hostile audience. He criticised Islam, defended a past head of the Ku Klux Klan but insisted that he was "not a Nazi". In a press conference on Friday, the BNP leader said he would be making an official complaint to the BBC about the programme, saying its normal format had been "twisted" so that it focused solely on his views. "That was not a genuine Question Time, that was a lynch mob," he said. He challenged the BBC to ask him on the show again and to allow a wider range of subjects to be discussed. He also claimed the audience was not representative of the UK as a whole as levels of immigration in London meant it was "no longer a British city". Mr Griffin's fellow guests on the show said his performance had exposed his real views and the true attitudes of the BNP. Lib Dem home affairs spokesman Chris Huhne said Mr Griffin had been "taken aback" by the hostility of the audience which showed most people in the UK wanted "nothing" to do with his views. Justice Secretary Jack Straw, also on the panel, said Mr Griffin had been subjected to proper scrutiny and his performance had been "catastrophic". The BNP leader was booed at the start of the hour-long recording and accused of trying to "poison politics". He insisted his views had been widely misrepresented in the media and denied a string of statements attributed to him. The show covered topics including whether it was fair for the BNP to "hijack" images of Winston Churchill, whether immigration policy had fuelled the BNP's popularity and whether Mr Griffin's appearance was an early Christmas present for the party. The only question not to relate directly to the BNP concerned a contentious newspaper article written about the death of Boyzone singer Stephen Gately. The BBC said the questions had come, as usual, from the audience and were a response to issues in the news over recent days. "The programme is topical," a BBC spokesman said. "People would accept that the BNP and Question Time have been prominent topics this week." Members of the audience reflected a cross-section of political views and different backgrounds, the BBC stressed. The BBC said the audience figures - which peaked at 8.2 million - showed the level of public interest in the scrutiny of elected officials. "The BBC is firm in its belief it was appropriate for Mr Griffin to appear as a member of the panel," said deputy director general Mark Byford. Six protesters were arrested and three police officers injured during demonstrations outside BBC Television Centre ahead of the broadcast. Why exactly do people vote for the BNP?